These positions are open for 2017 – 2018: President–Elect, Vice President, Secretary, Assistant Secretary, Treasurer, Assistant Treasurer, four members of the Board of Medical Ethics, and one Trustee. In addition, there will be ten at–large seats on the Board. Elections will also be held to fill spots for delegates and alternate delegates to the Medical Society of the State of New York. Direct nominations to Jessica J. Krant, MD, MPH, Secretary, New York County Medical Society, 31 West 34 Street, Ste. 7053, New York, NY 10001. Governor Andrew Cuomo signed into law two bills supported by the Medical Society of the State of New York (MSSNY) designed to reduce the administrative burden on physicians in their dealings with health insurers. The first bill (A.501–E, Cusick/S.2545–D, Lanza) would reduce from 90 to 60 days the time within which a health insurer must complete its review of the application of a physician to participate in the network of a health insurer, as well as reducing from 90 to 60 days the time within which a physician in some situations can become “provisionally credentialed” if the plan does not complete its review. The bill also eliminates some ambiguous statutory language that currently gives discretion to a health insurer to delay a decision on a physician’s application after these deadlines have passed. The new law applies to credentialing applications received by insurers on or after April 1, 2017. The second bill (A.6983-A, McDonald/S.4721–A, Hannon) would direct the Commissioner of Health and Department of Financial Services to create standards to provide greater uniformity among health insurers when physicians request insurers to cover their patients’ needed prescription medications. MSSNY worked closely with the New York Chapter of the American College of Physicians in supporting the legislation. The law takes effect immediately. 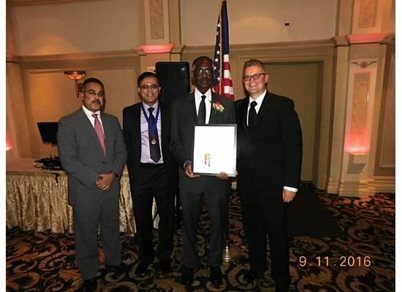 Doctor Clemendor receiving the award from Bronx County Leadership. Hats off to member Patricia McLaughlin, MD, a Manhattan ophthalmologist who was interviewed in Crain’s Health Care News, November 14, 2016. Doctor McLaughlin discussed the benefits she discovered after she opted out of Medicare, when the expenses involved without reimbursement affected her ability to give the best care. Current waivers for the New York State eRx program expire on March 26, 2017. Here is what you need to do if you hold a waiver. Some physicians have the “low–volume certification” — fewer than 25 prescriptions per year. If this is your situation, you’ll need to send in a new certification. You can send it in starting December 27, 2016. Log onto the Health Commerce System at https://commerce.health.state.ny.us, navigate to the “Electronic Prescribing Waivers” section, get to Form DOH-5221, and do your certification there. Or, if you need to request a paper form, please call (866) 811–7957. Other physicians have the “general waiver” granted to them for various reasons. You’ll need to submit a new request, with an updated statement of facts describing the continuing circumstances supporting the waiver. You can submit your request starting December 27, 2016. Log into the Health Commerce System at https://commerce.health.state.ny.us and access the “Electronic Prescribing Waivers” (EPW) application. Or, if you need to request a paper form, please call (866) 811–7957. For additional information about the waivers, go to www.health.ny.gov/professionals/narcotic. The follong announcemet is from the Medcial Liaiblity Mutual Insurance Company, the Society’s edn0rsed medical liability insurere. We’re pleased to let you know that MLMIC’s board has declared a new 20 percent general dividend for policyholders. The dividend — which will apply to policyholders who are insured on May 1, 2017, and maintain continuous coverage through July 1, 2017 — will be based upon the annual rate of premium in effect on May 1, 2017. It will provide meaningful financial relief to policyholders. The board’s decision to declare this dividend is based on MLMIC’s statutory admitted assets of approximately $5.8 billion, a surplus of $1.9 billion and statutory net income of approximately $100 million. These figures, available in the company’s September 30, 2016, statutory financial statement, show the company’s overall financial condition remains sound. completed by next year’s end. In the meantime, MLMIC’s strong financial performance enables it to offer a 20 percent dividend. If you are fully retired and age 67 or over age 72, you may qualify for life membership in the Society. Life membership must be applied for by the member. To inquire about applying, call the Membership Department at (212) 684–4682. Join the Society on Tuesday, December 20, 8:00 a.m. at Manhattan Eye Ear and Throat Hospital, 201 East 64 Street, Corwin Auditorium, for our Medicare seminar with expert Jim McNally. This year we’ll discuss the changes to the 2017 Medicare Physician Fee Schedule, but also provide an intensified and primary focus on the Merit Based Incentive Payment Program (MIPS)— the part of MACRA that’s relevant to most Society member physicians and their staff. The data you submit or attest to for Medicare in 2017 will dictate whether you will receive a positive payment adjustment to your Medicare payments — in other words, a bonus — in 2019; or whether your practice will be subject to a negative payment adjustment (or penalty). That’s why all physicians should know about MIPS. KNOW how you can do more than just avoid the penalty — you may possibly be eligible for, at least, a partial bonus. For the most part, you won’t need an EMR. However, you can do even better if you use an EMR and dig into the program more. Find out how, this December 20. The following article on Final Section 1557 Rule is provided by Donald Moy, Esq., of Counsel to Kern Augustine, which provides services to MSSNY members. If you have questions, Call Kern Augustine at (800) 445–0954. Section 1557 has been in effect since its enactment in 2010 and the HHS Office of Civil Rights has issued a final rule to implement section 1557, which was published in the Federal Register on May 18, 2016. The Final Rule became effective on July 18, 2016. Among the requirements of the Final Rule, covered entities must post notices of nondiscrimination and taglines that alert individuals with limited English proficiency to the availability of language assistance services. The Office of Civil Rights has translated a sample notice and taglines for use by covered entities into 64 languages. For translated materials, click here. The notice requirement becomes effective within 90 days of July 18, 2016, on October 16, 2016. The Final Rule also requires covered entities with 15 or more employees to have a grievance procedure and a compliance coordinator. The Final Rule includes a model grievance procedure. Is your medical practice a Covered Entity under the Final Rule? Does participation in Medicare part B or receipt of payments under Medicaid make a doctor's office a covered entity? Although HHS in the Final Rule takes the position that a doctor's participation in Medicare Part B alone does not constitute federal financial assistance, HHS takes the position that receipt of payment under Medicaid constitutes federal financial assistance, and HHS estimates that the vast majority of doctors are covered entities because they receive payments from Medicaid or receive federal financial assistance through other means. The following is from Winston Resources, LLC, the Society’s endorsed staffing service . No matter how small (or big) your practice is, you can always show appreciation for the staff who are on the front lines by your side. You may have the most profitable company in the world, but your employees will always be your most valuable asset. Failure to recognize employees for their hard work and efforts can result in a severe lack of engagement and morale, creating a toxic work environment that reduces productivity and employee retention. Employee recognition efforts are most effective when they are aligned with your company's core values and goals. To be successful, these efforts should always be part of a strategic leadership function that allows you to show appreciation for your employees' individual roles within the company. Mistake 1: Not communicating employee achievements on a regular basis. A lack of internal communication is a recipe for disengaged employees who will eventually grow disenchanted with your company. Communicating employees' achievements on a regular basis is an easy and effective way to show that hard work and dedication does not go unnoticed. Include briefs of employees' achievements in all internally distributed communications materials, such as employee newsletters, the company intranet news and weekly email updates. Post employee achievements to your company's social media platforms when appropriate. This could include posting a photo of an employee holding an award or a headshot of an employee who has recently been promoted within the company. The ideal social media sites for sharing these types of announcements include LinkedIn, as well as Facebook and Twitter. Announce employees' achievements at weekly or monthly company meetings, expressing remarks of congratulations and appreciation. In addition to publishing news on your company's communications platforms, encourage managers to personally congratulate members of their teams. A verbal "congratulations" can go a long way in making employees feel recognized by those above them! Distribute news releases to announce promotions, board appointments, awards and other newsworthy points of recognition. These announcements will often be published in local media outlets, giving employees public recognition for their accomplishments in their communities. Mistake 2: Neglecting to celebrate milestones. In addition to recognizing individual accomplishments, it's a best practice to honor employees who have been employed with your company for several years. Milestone awards are often announced at monthly or annual company meetings in which employees are honored with certificates and gifts of appreciation for their long-term commitment and service to their company. In many instances, they are given to employees with work anniversaries marking as little as five years, or as long as 25 or 50 years. Celebrating milestones can demonstrate to all employees that your company values longevity and recognizes those who remain committed to its mission. Not only does this contribute positively to employee satisfaction, but increases long–term employee loyalty and promotes a culture of professional growth. Though most companies treat bonuses as pure financial incentives for achieving specific performance goals, bonuses can also be offered as a way to enhance company morale. For example, consider awarding bonuses in the form of a "co–worker bonus program." This type of program would allow employees to award $25 or $50 bonuses to colleagues who they believe have exhibited a high degree of professional achievement each month. Bonuses can also be given in the form of gift cards or paid days off. Co–worker bonus programs not only incentivize employees to work well on a team, but encourage colleagues to empower and recognize each other, resulting in improved employee morale and engagement. Communicating and celebrating employees' accomplishments, as well as creating financial incentive programs that promote goodwill among all employees, can ultimately be one of the best decisions you make for your company's culture and bottom line. Establishing an employee recognition strategy will allow your company to experience a positive culture and growth, giving you the opportunity to honor your employees for their work on a regular basis. And, remember, if the types of initiatives above are too complex for your company to implement, simplify your ways of showing appreciation. Here's one idea: Why not give a deserving employee a day off and ask your staffing partner to provide a qualified temporary to pick up the slack? Your employee will thank you! Got Kids? Got a Plan? The Society introduces your access to JPMorgan's NY 529 Advisor–Guided College Savings Program. Society members can utilize this benefit in one of two ways: You can sign up for the program directly as a member using the New York County Medical Society Group ID, OR you can offer the program to employees of your practice using your own Group ID number. As you may know, Oxford recently announced its decision to withdraw HMO health plan options from the individual and group markets effective January 1, 2017. Some of you have been notified of the cancellation of your HMO plan. At New York County Medical Society, we find this presents a challenge for many of our members to provide medical insurance for themselves, their families and the employees within their practice. As the healthcare industry continues to rapidly evolve, insurance companies are offering smaller networks with fewer hospitals and specialty physicians despite increasing prices. The insurance market has become especially narrow for individuals and small to mid–sized physician practices. As a result, we have chosen to partner with IdilusHR, an organization that provides custom HR and benefit solutions, to provide a variety of services to benefit both our members and their practices. Among these benefits is a variety of affordable and comprehensive medical insurance solutions for those affected by Oxford’s non–renewal of HMO plans. IdilusHR offers eight different health plan options — with out–of–network benefits — to meet the needs of physician practice employees and owners. In addition, IdilusHR is offering all New York County Medical Society members a 20 percent discount on their administrative fee. It is important to understand that IdilusHR is not an insurance broker but instead a PEO. That means that they are providing a comprehensive HR package that includes the ability to purchase health insurance and other benefits as large employer and a lower rate. They charge a fee for their services on a monthly basis. Hopefully the savings resulting from large volume purchasing and reduced accounting and payroll costs will offset a significant percentage of their monthly fee. *Example Price is for the Flex 2500 plan. HIPAA Secure Now, the Society’s endorsed vendor on HIPAA issues provides us with some helpful guidance on cloud computing for Covered Entities from The Office of Civil Rights (OCR) and Health and Human Services (HHS) . 1. May a HIPAA–covered entity or business associate use a cloud service to store or process ePHI? Yes, because the CSP receives and maintains (e.g., to process and/or store) electronic protected health information (ePHI) for a covered entity or another business associate. Lacking an encryption key for the encrypted data it receives and maintains does not exempt a CSP from business associate status and associated obligations under the HIPAA Rules. An entity that maintains ePHI on behalf of a covered entity (or another business associate) is a business associate, even if the entity cannot actually view the ePHI. Thus, a CSP that maintains encrypted ePHI on behalf a covered entity (or another business associate) is a business associate, even if it does not hold a decryption key and therefore cannot view the information. For convenience purposes this guidance uses the termno–views services to describe the situation in which the CSP maintains encrypted ePHI on behalf of a covered entity (or another business associate) without having access to the decryption key. 3. Can a CSP be considered to be a “conduit” like the postal service, and, therefore, not a business associate that must comply with the HIPAA Rules? 4. Which CSPs offer HIPAA–compliant cloud services? 5. What if a HIPAA–covered entity (or business associate) uses a CSP to maintain ePHI without first executing a business associate agreement with that CSP? Yes. Health care providers, other covered entities, and business associates may use mobile devices to access electronic protected health information (ePHI) in a cloud as long as appropriate physical, administrative, and technical safeguards are in place to protect the confidentiality, integrity, and availability of the ePHI on the mobile device and in the cloud, and appropriate BAAs are in place with any third party service providers for the device and/or the cloud that will have access to the e–PHI. No. The HIPAA Rules require covered entity and business associate customers to obtain satisfactory assurances in the form of a business associate agreement (BAA) with the CSP that the CSP will, among other things, appropriately safeguard the protected health information (PHI) that it creates, receives, maintains or transmits for the covered entity or business associate in accordance with the HIPAA Rules. The CSP is also directly liable for failing to safeguard electronic PHI in accordance with the Security Rule and for impermissible uses or disclosures of the PHI. The HIPAA Rules do not expressly require that a CSP provide documentation of its security practices to or otherwise allow a customer to audit its security practices. However, customers may require from a CSP (through the BAA, service level agreement, or other documentation) additional assurances of protections for the PHI, such as documentation of safeguards or audits, based on their own risk analysis and risk management or other compliance activities. 11. If a CSP receives and maintains only information that has been de–identified in accordance with the HIPAA Privacy Rule, is it is a business associate? No. A CSP is not a business associate if it receives and maintains (e.g., to process and/or store) only information de–identified following the processes required by the Privacy Rule. The Privacy Rule does not restrict the use or disclosure of de–identified information, nor does the Security Rule require that safeguards be applied to de-identified information, as the information is not considered protected health information. See the OCR guidance on de–identification for more information. Medicare Enrollment Period to Change Participating or Nonparticipating Status is Open: NGS Medicare is mailing postcards to all eligible physicians, practitioners, and suppliers to announce the annual participation open enrollment period, including instructions for obtaining the 2017 MPFS pricing. Status for participating or nonparticipating providers will remain in effect through December 31; no further action is required. If a change is submitted during open enrollment, the effective date will be the following January 1. Important note: The participation postcard is separate from revalidations or opting out regulations. Send a written notice on provider letterhead to include all credentials (PTAN, NPI, TIN/EIN/SSN) of intent to change your status to nonparticipating. This request shall be signed by provider, authorized, or delegated official fo theNPI requesting the change. Mail form CMS-460 signed by provider, authorized, or delegated official of the NPI requesting the change. The form shall be dated and contain legal name, legal business name, address, and all credentials (PTAN, NPI, and TIN/EIN/SSN). To read the full announcement, click on the link here. 2017 Medicare Part B Deductible Announced: CMS announced that the annual deductible for all Medicare Part B beneficiaries will be $183 in 2017 (compared to $166 in 2016). Premiums and deductibles for Medicare Advantage and prescription drug plans are already finalized and are unaffected by this announcement. MSSNY Announces Liquidator’s Adjudication of Policy Claims Against Health Republic Insurance: On September 15, 2016, the Supreme Court for the State of New York signed an order setting October 11, 2016 at 10:00 a.m. as the date and time for any interested parties or their attorneys to appear and show cause why an order approving certain procedures (the “Claims Adjudication Procedure”) for adjudicating claims for payment under Health Republic’s insurance policies should not be entered. If you are a health care provider and have a Policy Claim against Health Republic, you should have submitted your Policy Claim in accordance with the deadlines and procedures set forth in the contract governing your provision of services to former members of Health Republic (your “Health Republic Contract”). If you already properly submitted a Policy Claim in accordance with the requirements of your Health Republic Contract, you do not need to re–submit it. It is anticipated that EOBs will begin to be mailed to Providers and Members in the first quarter of 2017. If a Provider accepts the EOB, they are not required to take any further action. If a Provider disagrees with the EOB, they will have the opportunity to appeal any and all determinations set forth in the EOB through Health Republic’s website at www.healthrepublicny.org or by paper copy to the address indicated in the Claims Adjudication Procedure. The written appeal and supporting documentation must be submitted within 60 days of the date of mailing of the EOB. The Liquidator and her agents, utilizing the appropriate resources to investigate the appeal, will review each appeal and, within 60 days, either grant the appeal and issue a revised EOB or deny the appeal and provide the reasons for the denial. If a Provider objects to the determination of the appeal, the Provider will have 30 days from the date the notice of denial is sent to file an objection to the denial of the appeal. PROVIDERS WHO WOULD LIKE TO RECEIVE A HARD COPY OF THE CLAIMS ADJUDICATION PROCEDURE SHOULD CONTACT THE GARDEN CITY GROUP VIA THE HEALTH REPUBLIC HOTLINE at (866) 680-0893. Requests for further information or questions may be directed to (866) 680–0893 or www.healthrepublicny.org. HHS ONC Releases EHR Contract Guide: The U.S. Department of Health and Human Services’ (HHS) Office of the National Coordinator for Health Information Technology (ONC) recently released two practical, easy-to-understand tools to help health care providers get the most out of their health information technology (health IT), such as electronic health records (EHRs): an EHR contract guide - PDF and a newly expanded Health IT Playbook. The Health IT Playbook is a dynamic, web–based tool intended to make it easy for providers and their practices to find practical information and guidance on specific topics as they research, buy, use, or switch EHRs. To read this document, click on the link here. It is highly recommended that you review your practice management systems and business processes and determine what changes you need to make to use the new MBI. eMedNY Alert on Medicaid Enrollment Revalidations: Effective for eMedNY claims processing starting October 27, 2016, all claims from non–revalidating billing providers will be pended until the provider’s revalidation package is received. To avoid interruption of claims payment, providers must revalidate immediately. 1. Visit the Provider Enrollment page at www.emedny.org/revalidation, locate your enrollment form and additional required documentation, and determine whether an enrollment fee is required. There is a slide presentation, step-by-step processes, and an FAQ section. These resources provide important information on the revalidation process. 2. Complete and mail the appropriate form(s) with all required documentation to the address provided. Keep a copy of the forms and documentation. 1. Allow 2 to 3 weeks for the receipt and processing of the revalidation packet by eMedNY. Once your completed revalidation is received and processed, all claims that have been held due to missing or late revalidation will be released for processing during that cycle. On November 22, 2016, the U.S. District Court in Texas blocked the Department of Labor's (DOL’s) overtime rule from going into effect on December 1. (See the article below for information about the new rules.) The emergency motion was granted at the request of 21 states, the American Society of Association Executives (ASAE), the U.S. Chamber of Commerce, and other like–minded organizations. The lawsuit was filed on the grounds that the DOL has overstepped its authority and put forward an onerous regulation that has to be stopped before the implementation date. From the beginning, ASAE has said it is not against an increase in the salary threshold for overtime eligibility, but doubling that threshold and creating a “one–size–fits–all” measuring stick for overtime eligibility across the country is just not workable for many employers and could do more harm than good for many affected employees as well. Judge Amos Mazzant of the U.S. District Court for the Eastern District of Texas granted a nationwide preliminary injunction against implementation of the DOL overtime rule. The judge granted the injunction as it “preserves the status quo while the court determines the department's authority to make the final rule as well as the final rule’s validity.” In this injunction the court ruled regulation exceeded the authority granted to the DOL by Congress. This decision was only temporary, but it delays the implementation from taking place as planned next week. The DOL will very likely appeal the injunction. The following is from IdilusHR, the Society’s endorsed Professional Employer Organization (PEO). For information, call (877) 545–5666 or go to www.nycmsbenefits.com. In May, the Obama administration announced new overtime requirements that may affect more than four million workers in the United States. According to the new U.S. Department of Labor (DOL) rules, which amend the Fair Labor Standards Act, salaried employees who are paid less than $47,476 per year must be paid overtime — even managers and others in supervisory roles. Effective December 1, 2016, the new threshold is roughly double the previous amount of $23,660 and may have broad implications for employers across a wide range of industries, including healthcare, advertising, media, manufacturing, hospitality and retail. Under the guidelines, employees making less than $47,476 per year — or $913 per week — must be paid overtime wages if they work more than 40 hours per week. Set the minimum salary required to qualify for overtime exemption at the 40th percentile of weekly earnings for full–time salaried workers in the country’s lowest–wage census region (currently the South). Increase the total annual compensation requirement to exempt highly compensated employees (HCEs) from $100,000 to $134,004 (the annualized value of the 90th percentile of earnings of full-time, salaried workers nationally). Automatically update the minimum salary and compensation levels regarding exemption every three years, beginning January 1, 2020. The DOL estimates the first update to the salary threshold will be $984 per week, or $51,168 annually. Allow — for the first time — nondiscretionary bonuses, incentives and commissions to count toward up to 10 percent of the required salary level. To qualify, employers must make these payments on a quarterly or more frequent basis. Job descriptions: Each role at a company should have a detailed job description, that outlines the duties, responsibilities and day-to-day expectations. In some cases, individuals with management titles may not, in fact, have any day–to–day supervisory duties. After–hours email: Under the new rules, checking email outside of regular business may count towards an employee’s 40–hour work week, particularly if the company issues mobile devices. Policies should be detailed and should spell out exactly what is expected of each employee. Compliance with the new rules may not always be cut and dry, and the administrative burden on employers could be steep. The DOL estimates that direct administrative costs for employers to implement the new rules could amount to more than $250 million a year; in some cases, it may be less expensive to clarify job duties and put an entire workforce above the $47,476 threshold than deal with the ongoing compliance issues. Q: We lease space for a specialty practice and we’ll need to renew our lease next year. Our landlord says he’ll just send over a “one pager.” We have a good relationship, but I’m not sure if this is the right way to proceed. What should I do? A From Marisa Manley, President, Commercial Tenant Real Estate Representation, LTD, and the Society’s Commercial Tenant Concierge Program: Completing a lease renewal (extension agreement) can be as complicated as negotiating a new lease – and often it should be! Consider whether your needs have changed, how the facility has aged, whether you are satisfied with the landlord’s performance, whether you anticipate changes in your operations during the upcoming lease term. Assessing all relevant factors as you consider the space you occupy for the next three, five, 10 or more years, is the important place to begin. Documentation will follow. When you’re ready to make significant decisions about your lease commitments, Commercial Tenant Concierge can help you develop relevant options and assess the operational and financial pros and cons of each. To be referred, call the Society at (212) 684–4691. You need to include your NPI number on your prescriptions (electronic or written). This will enable Medicare Part D to verify your enrollment or opt out status with NGS Medicare; and pay the pharmacy for the drugs you ordered. If you are retired; but, still write scripts, you must be enrolled in Medicare or have a valid Opt Out. In addition, for any script you write, you need to have a medical record even if it is kept on an index card containing patient information and the reason for the script. A point of information for those physicians who have retired and are no longer compensated for medical care provided — a waiver of the fee for the registration of your license as a physician in the State of New York is allowed under the provisions of Section 6524(10) of the New York State Education Law. This law allows a waiver of the registration fee requirement for physicians who certify to the State Education Department that, for the period of their registration, they will only practice medicine without compensation or the expectation or promise of compensation. The waiver of the registration fee is limited to the duration of the registration period indicated of the affidavit. http://www.mcms.org/sites/default/files/resources/NC-Affidavit11-02.pdf or see attached. Morton Arthur Bosniak, MD. Doctor Bosniak received his MD degree from SUNY Downstate Medical School in 1955. Emanuel Goldberg, MD. Doctor Goldberg received his MD degree from University of Vermont College of Medicine in 1953.